NASA astronaut Peggy Whitson floats through the Unity module aboard the International Space Station during the Expedition 50 mission in this photo taken on November 28, 2016. 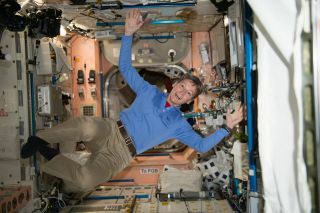 President Donald Trump will make an out-of-this-world call Monday (April 24) to congratulate NASA astronaut Peggy Whitson on her record-breaking mission to the International Space Station. Trump, first daughter Ivanka Trump and NASA astronaut Kate Rubins will make a 20-minute call to Whitson from the Oval Office at 10 a.m. EDT (1400 GMT) on Monday, NASA officials announced today (April 18). The callers will personally congratulate Whitson for her epic achievements in space, they added. Whitson first flew to space in 2002 as part of the station's Expedition 5 mission and returned in 2007 during the Expedition 16 mission. It was during Expedition 16 that Whitson first took command of the International Space Station — a first for a female astronaut. She has also served as NASA's first female chief astronaut and has performed eight spacewalks during her career. You can watch Trump's Earth-to-space call to Whitson live online. NASA TV will broadcast video of the call online, which you can also see here on Space.com, and the agency will also make the video available to schools, museums and other groups across the United States and around the world, NASA officials said. "The Department of Education and NASA are working together, on behalf of the White House, to encourage classrooms throughout America to tune-in to this historic event," NASA officials wrote in the statement. "They also are making available for voluntary use STEM on Station educational materials that may be helpful to further engage students in the classroom. STEM on Station is comprised of education activities that follow astronauts as they demonstrate STEM concepts such as Newton’s Laws of Motion, surface tension and advances in technology." Whitson is currently the commander of the space station's Expedition 51 crew, which also includes Russian cosmonaut Oleg Novitskiy and French astronaut Thomas Pesquet. She arrived at the station in November 2016 as part of the then-Expedition 50 crew. The Expedition 50/51 mission is Whitson's third spaceflight, all of which have been long-duration missions to the space station. On Thursday (April 20), two new crewmembers — Jack Fischer of NASA and Fyodor Yurchikhin of Russia — are scheduled to arrive at the station. Fischer is expected to join Whitson during the call from Trump. Whitson, 57, hails from Beaconsfield, Iowa, and has degrees in biology and biochemistry. She first joined NASA's Johnson Space Center in Houston as a research biochemist in 1989 and was selected for the astronaut corps in 1996.